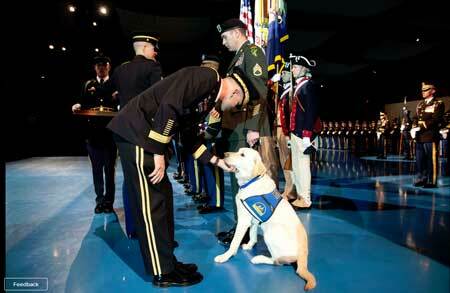 SSG Barbare’s companion Javier receives recognition during the retirement ceremony at Ft. Meyer. And now more of the story. Upon his retirement the recipient of two purple hearts took on a live-in companion named “Javier.” “Javier” is a K9 Companion and is always close to his partner, SSG Barbare, assisting him in coping with some of the hurdles that his traumatic brain injuries left him unable to handle for himself. The two-year-old lab even accompanied John to the birth of his and wife Michelle’s first son Cameron. It has also been reported that John and Javier have become the sweethearts of the Baltimore television news scene. A man and his dog or a dog and his dog if you wish. Remember, John is a Citadel graduate.